As requested by my latest twitter poll, here I am with a brand new recipe for you guys: Spinach and Mushroom stuffed Calzone. 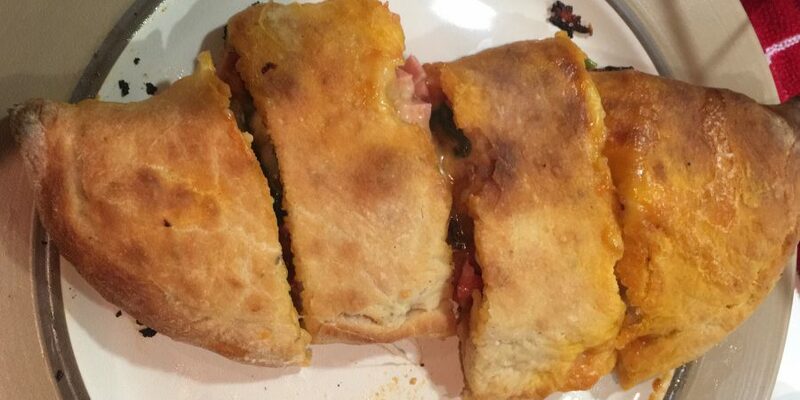 Now as well know a calzone is pretty much a folded over pizza, but yet it is so much more. There is something about the crunch on the outside and the hot fillining spilling out your tongue that is just oh so satisfying. Now this recipe is pretty straight forward. You can use a filling of your choice, I’m using a simple family favourite: spinach and mushrooms. The first thing you will need is some pizza dough, you can find my recipe for that here. Cut your tomatoes into 4 segments and in a nutriblender or food processor blitz them, set them aside. In a pan heat up 1-2 tablespoons of olive oil, and add in your onions. Fry them over a low heat until they become translucent, then add in your blitzed tomatoes. Let it simmer for about 10-15 minutes. Season with salt and pepper and add in your chopped basil and parsley, cook until it thickens and set aside. In a small pot heat up 1 tablespoon of online oil and add in your mushrooms, gently fry them until they are soft. Add in your spinach and chilli flakes and let it cook until the leaves are limp. Add in the turkey and train the pot of all excess liquid. Set aside. Divide your though into 2 pieces and on a floured surface start rolling the first bit of dough until it has a diameter of 8-9 inches and brush some of your sauce on it. If it’s too thick you can just keep rolling and then cut the excess off. Take some of your filling and put a couple of tablespoons on one half of the circle. Add some mozzarella on top of it. Now fold the empty half to cover the other half. Fold the edges over in order to seal it. Brush it with olive oil and poke a hole to let the steam out. Bake at 200C for 20 minutes or until it puffs up and looks golden. You can serve it while but I like to cut it in segments because it’s easier to eat ? Really like the combination of spinach and mushrooms!